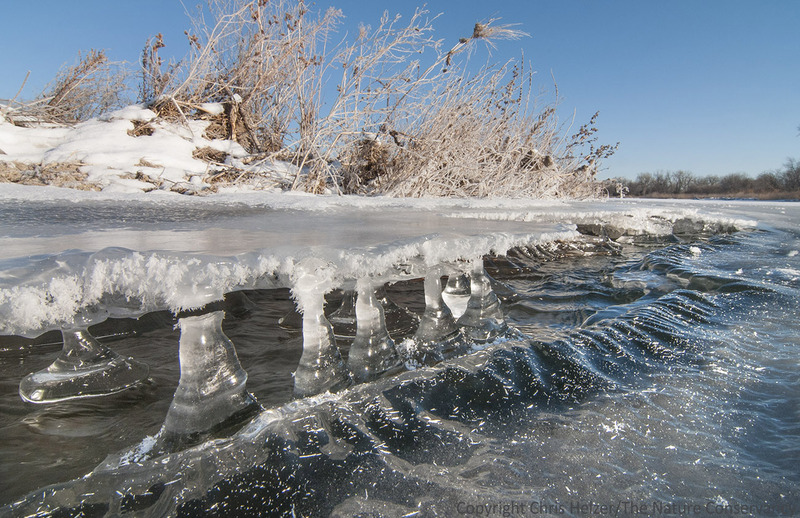 Columns of ice along a patch of open water on the Platte River. Hamilton County, Nebraska. It looked like the splashing of the passing river by had created stalactites of ice around some of the uneven edges of the holes. Over time, those stalactites had widened into wide-based columns that spanned the 3-4 inch gap between frozen surfaces. Regardless of how it formed, it was sure attractive in the early morning sun. A close up of some of the columns. The edges of the ice were rimmed by frost, as were some of the plants nearby. Not that there was any need for the frivolous decoration – the ice was plenty attractive on its own. Very carefully, I slid myself on my belly toward the edge of the ice hole until I heard the first small cracking sound. That seemed like a good place to stop. Then, lying on the frozen river and photographing ice, water, and frost, I thought about (as I often do) how glad I was that no one was around to watch me. Frost-covered plants on a small sandbar near the open water. Many thanks to those of you who have already taken Eliza’s survey of blog readers. If you haven’t yet taken it, please consider helping her out. You can find the survey here. Thanks! 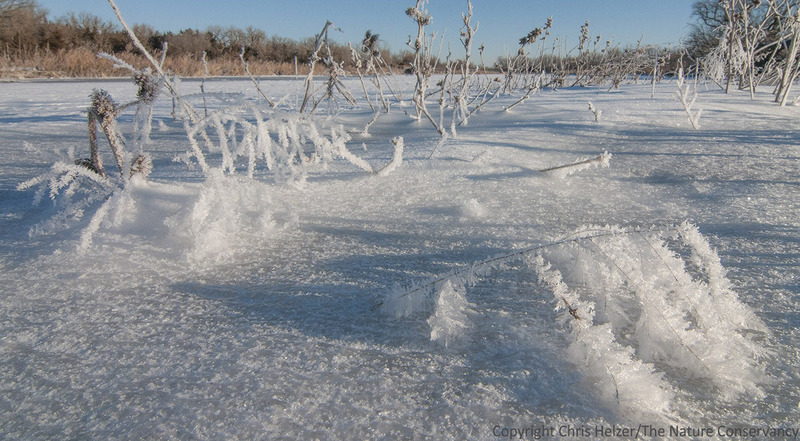 This entry was posted in General, Prairie Photography and tagged columns, hoar frost, ice, nebraska, patterns, photo, photography, platte river, river, stalactites, water by Chris Helzer. Bookmark the permalink. glad you didn’t break through. Photos are stunning. Not sure it was worth risk, but maybe you know water depth was no problem there. You keep on inspiring me to get out more often with my camera. Today I was skiing our woods and there were more deer prints than ski tracks on my packed route. I tried to explain how this ice formed. I clicked on one of your photos to get a closer look when I had almost finished. Instead of opening a new browser, the photo showed up in this browser. I clicked the back button, but my comment was already gone. I do not feel like rewriting the whole comment. The main point was the ice columns in your photo formed by additional ice being accumulated at the bottom. This is different than icicles or stalactites which have the water drip down them from the top.